Wow.. I am finally ready for my first post… after a lot of hours building my page content. I hope you will find my site useful when planning your next event. Be sure to let me know if you found this site useful (or not) by commenting on my blog. I think the word “celebration” says it all. If I don’t have a holiday to celebrate then I tend to make something up just to have an excuse to PARTY! January is not usually a big party month per say but it can be a catalyst for next year’s holiday planning. I know what you are thinking; this lady is nuts or a cousin to Martha Stewart. I assure you that I am in no way related to Martha but I might be a little wacky and frugal). I love to start planning a holiday plan/theme for the following year in November. Don’t go just yet, there is a method to my madness! In November, stores have just about everything holiday related on the shelves or online which allows you the luxury of examining possible future decorations before they will be placed on closeout. (Be aware that some of the more unusual decor may need to be purchased prior to being discounted or you may lose out). I start making mental notes on what I would like to purchase for the following year and I ask the stores when they will be placing them on clearance and at what percent discount. Most stores are more than happy to help you because they do this every year they have approximate dates when they will discount certain items at 50, 75 or even 90% off. They want to please their customers and clear the shelves for new, unrelated merchandise. They won’t think you are cheap (or crass) because you are really doing them a favor. Lighting and decor (especially popular and expensive new products) may need to be purchased the day after Christmas. For instance, you see sets of really nice programmable, LED exterior strands. If you want them for the following year you may need to watch (or check) and see how many have been sold or are left on the shelves just before the holiday. Most stores DO NOT have additional stock in the back and they have also lowered their exposure by having online options that they offer throughout the year. The big box stores do this by having x amount of stock that will service many regional stores. Also, they may offer a particular item and when you order, they order it from a wholesaler and send it (at no shipping cost to you) directly to the closest store for pickup and if the item has gone on sale after your purchase date let the retailer know and they will look up the items lowest price and make the appropriate discounts. Take a chance! 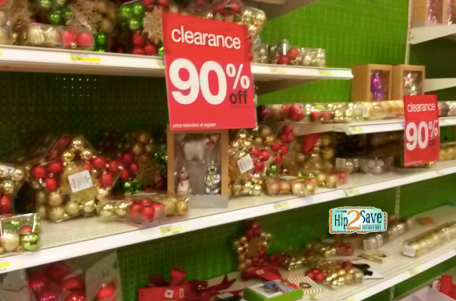 If the stores are offering the tail ends of their holiday decor at 10 cents on the dollar (90% off) it might just be worth buying items that might work for the coming or future years’ celebration. Most of all, have some fun with your searches and remember a $25 dollar investment at 90% off would normally cost $250.00. I make an after Christmas budget knowing that I will want to spend about a $100.00 and after the season ends. And… the 90% discount saves me a whole lot of mullah at 10 cents on the dollar. Just be sure to label the boxes you put away with: “Christmas 2015 decor” or your new boxes will be loss and forgotten by the next season. You might be a little late for this years Christmas or seasonal holidays but remember, Valentine’s Day is just a few weeks away and who’s to say that you can’t get great Valentine’s decor/gifts at 90% after the 14th! Please explore my pages and look for my updated blogs on upcoming holidays and party planning. See you soon you party animal, you! I am so happy to see a Blog like yours. I know I”ll use it a lot! !